Keith Mendivil in custody on domestic violence-related charges. 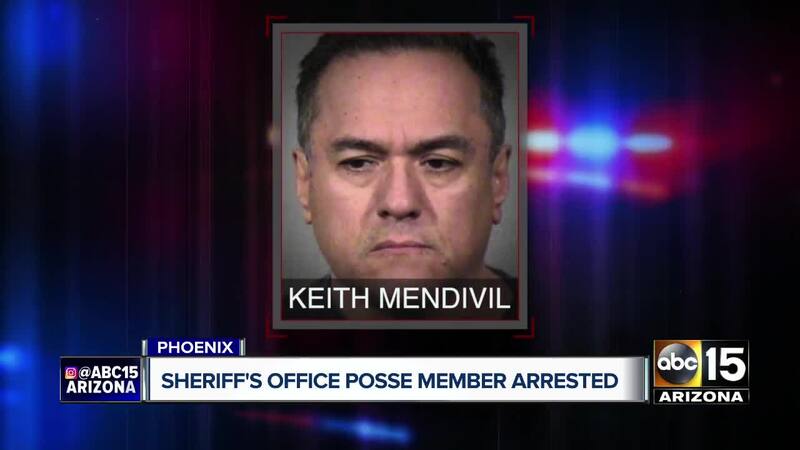 PHOENIX, AZ — A Maricopa County Sheriff's posse member has been removed from the program after being arrested on domestic violence-related charges. MCSO officials say Keith Mendivil was taken into custody on Friday by the Phoenix Police Department. Authorities say Mendivil joined the posse in 2016, and prior to the Jan. 25 temporary suspension of all posse enforcement operations , carried the Qualified Armed Posse (QAP) designation. "Through the new background process, we will ensure that we have an institutional standard and ongoing reviews. This will enable us to protect the integrity and reputation of our office and the law enforcement profession," said Sheriff Paul Penzone. MCSO did not release details of the incident that led to Mendivil's arrest.